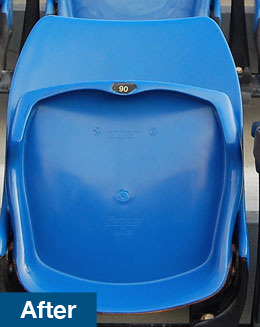 Seat Renew are experts in plastic restoration, our process takes old, faded and weather damaged stadium seats and restores them back to original colour, brightness and shine. Plastic restoration is quick, cost effective and convenient, seats are restored on-site and in their frames for a fraction of the cost of buying new seats. Seat Renew offer stadium seat restoration in the form of a Fade Management Plan to stadiums worldwide. It’s a quick and simple way to give your stadium the face lift it deserves. Plastic seat restoration returns seats back to their original colour and condition. First our team of technicians deep-clean the seats in the stadium while still on their fixtures. Second we apply our restoration process, this involves a product that reacts with the contaminants on the plastic surface and combats the oxidization and fading effect. Once the colour is restored to the plastic we then apply a protective sealant that helps to weather proof the seat and locks in the results achieved during the restoration process. The sealant locks in the results of the restoration process and enables the seat surface to repel moisture and contaminants such as drink spills which results in the seats being considerably easier to clean. The sealant also has antimicrobial qualities which help resist the development of future mould. Annual maintenance including re-application of the sealant ensures stadium seats remain in great condition year after year. 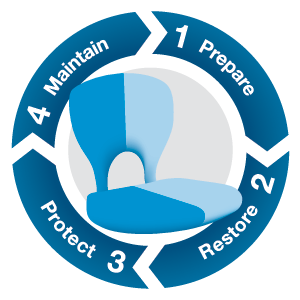 A Fade Management Program ensures the seats are restored followed by annual maintenance so that they remain in the best possible condition for the duration of the contract. This will involve a deep clean and reapplication of sealant or where needed a full re-restoration (at no additional cost). This is done at a fixed price so you know exactly what the costs will be for the term of the contract. By spending a lesser amount every year on maintenance rather than replacement, the useful life of these expensive assets can be doubled or tripled which all adds up to greater savings for stadiums. The big advantage of a Fade Management Program is the seats are returned to the restored condition every year maintaining a consistent and ageless look for the venue. New stadium seats can start to fade from the moment they are installed, the colour starts to diminish and then a haze starts to build up over them, before long they are starting to look white and a chalky and rub off on clothing every time your customer sits on them. If you leave them long enough they will go scaly and start to grow mould which is commonly mistaken for dirt and very difficult to remove. This is not a new phenomenon. 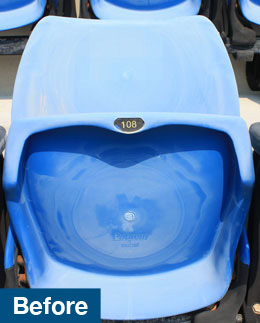 Stadiums around the world have grown to accept this as part of the natural life cycle of a plastic stadium seat. Venues generally install new stadium seats then start accruing the budget to replace them. 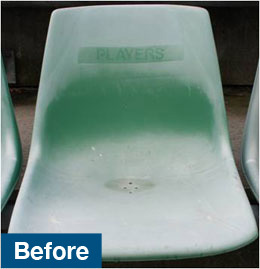 Restoration is much cheaper, quicker and more convenient than buying new stadium seats. We believe all business should be as environmentally responsibility as possible and this was one of the main considerations in the development of the plastic restoration process. Instead of looking at ways to recycle plastic, at Seat Renew we think the “greener” thing to do is to “reuse” plastic seats by simply making them last longer. By definition restoration is a sustainable choice, by making seats last longer rather than installing new stadium seats, there is no land fill, no cost of recycling, and no down time for the facility as seats are restored on-site and on their frames. And of course it is considerably cheaper than buying new seats, this is where environmental policy benefits stadium budgets. The restoration process uses only environmentally friendly products, produces no harmful by-products and has low water usage. Perhaps that’s why Seat Renew were finalists in the New Zealand Government Green Ribbon Awards.